A Revere man was involved in a recent and unusual pedestrian accident in Massachusetts. It all happened as the 70-year-old man was waiting for his turn to cross the street and a 200-foot hose that was hanging off the side of a fire truck flew over and struck him unexpectedly. Luckily, a security camera nearby was able to catch the whole thing on tape, according to NECN. The accident happened at the corner of Dale and Park. Witnesses reported that the pedestrian was struck pretty hard and was left in horrible condition. The accident could have turned out much differently though. The same type of accident took the life of an 83-year-old pedestrian in Cambridge about two years ago. 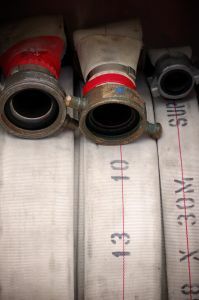 Our Boston personal injury attorneys understand that the fire department has announced that it’s making changes to its safety procedures since the accident, but these accidents cannot be prevented unless employees and departments exercise precautions. The fire department reported that it has ordered special netting kits for all of the trucks’ engines that were manufactured after 2008. That’s when a safety measure was passed to require that trucks have this safety feature. “It caught his legs and flipped him up in the air,” said Fire Chief Eugene Doherty. This netting is used to cover up the hoses on these trucks to prevent them from flying off while in motion. The department has two additional trucks, but those were made after 2008 and already have the safety netting. “It’s something the manufacturers saw fit to do in 2008,” said Doherty. Doherty goes on to say that he’s not blaming the manufacturers for the accident, but he says safety precautions should have been more specific and should have been required on all trucks. The chief thinks that the hose may have fallen loose because the nozzle wasn’t positioned correctly. He says the hose’s nozzle should have been kept in the middle of the compartment that’s located on the top of the fire truck. He believes that the nozzle could have been positioned too close to the edge. All of the firefighters at that department are going through more training courses to help them to ensure that the nozzle is properly stored. He says all fire chiefs should consider retraining their fighters. Since a recent meeting among area chiefs, all concluded that safety procedures need to be reassessed. “Wrong place at wrong time,” said one of the victim’s neighbors. A family member of the victim reports that the 70-year-old man is in the hospital being treated for broken bones and a concussion. If you’ve been involved in an accident with a government or county vehicle, it is critical for you to contact an attorney to help you represent the case. Oftentimes these parties are able to fight with the help of large and powerful representatives. Legal representation can help you to gain the compensation you deserve. If you or someone you love has been injured in Massachusetts, contact Boston Injury Attorney Jeffrey S. Glassman for a free and confidential appointment to discuss your rights. Call 877-617-5333.